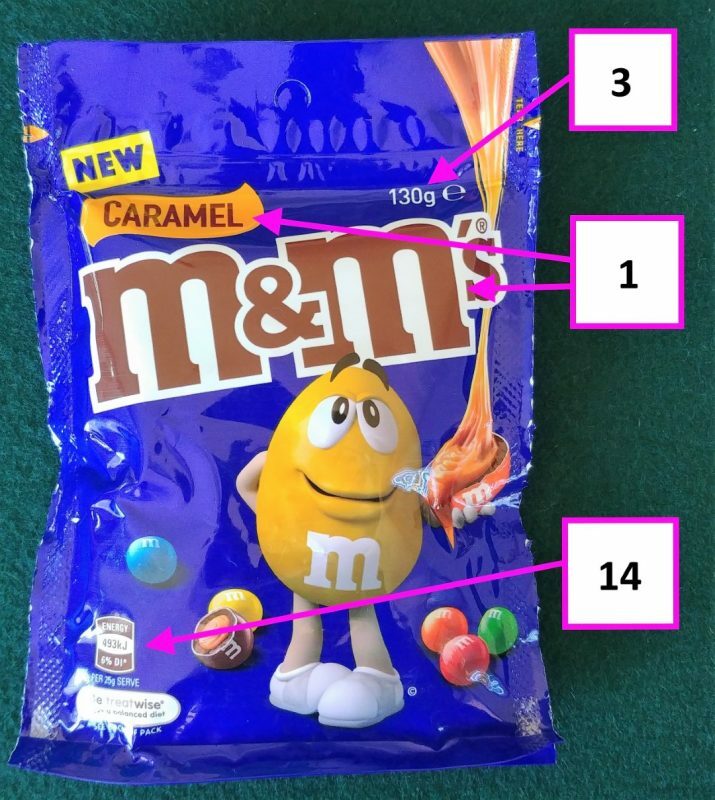 Prescribed Name, Name or Description of Food – Front of pack is the product is M&M’s with the flavour being caramel. 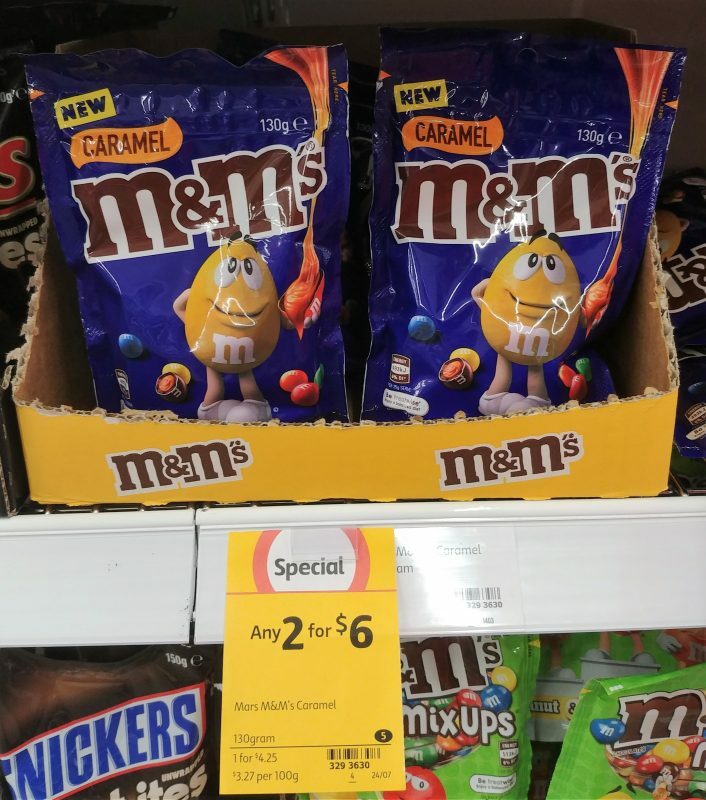 Back of pack has the word ‘Confectionery’ which is clear with a description of the product – Bite size pieces of milk chocolate with a caramel centre coated with a thin crisp shell. 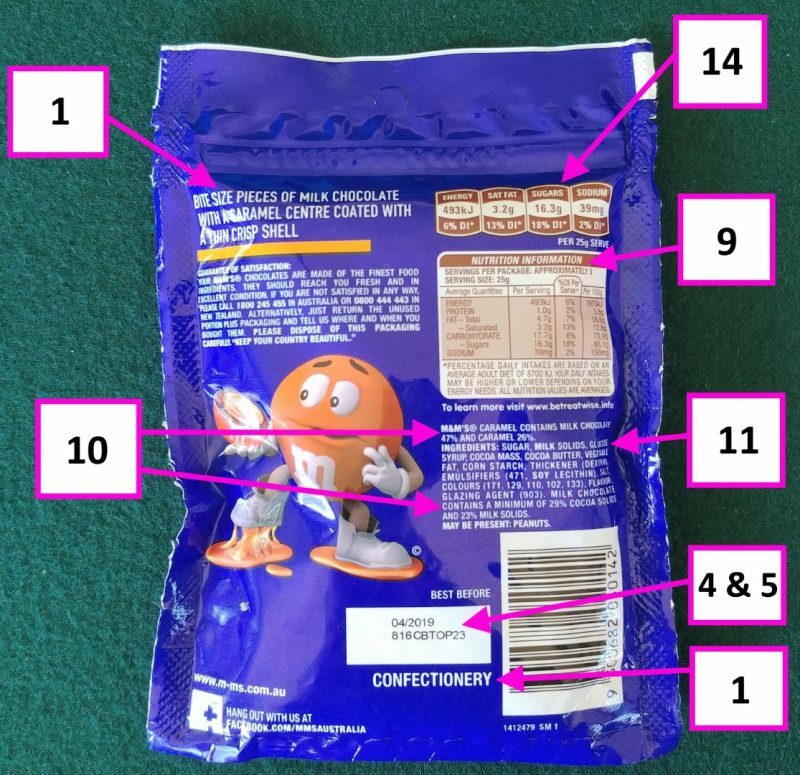 Company Name and Address – This information is found on the bottom of the pouch and the imported by details being Mars Chocolate Australia. 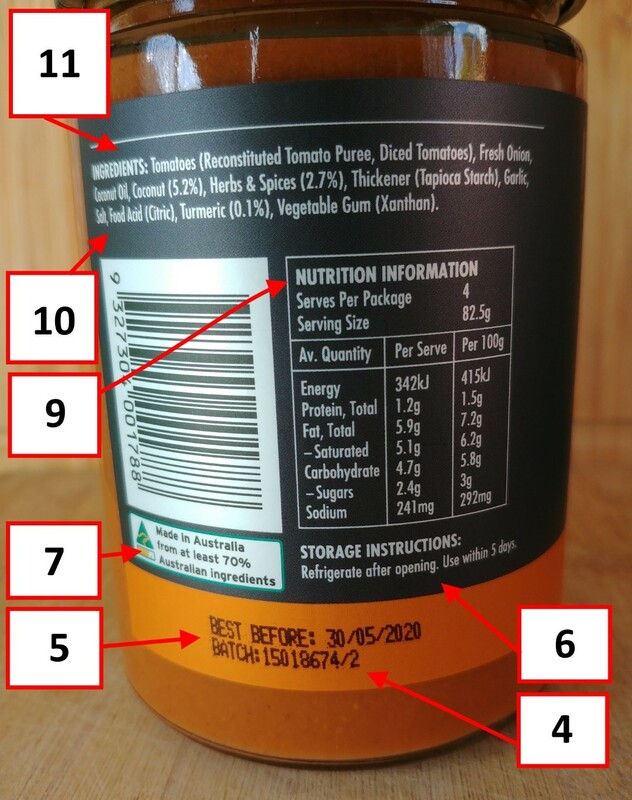 It also has the Mars New Zealand address which is extra information as Australia and New Zealand share the same Food Standards Code and can list just Australia or New Zealand company details. Weights and Measures Declarations – Clear and is printed in a colour that provides a distinct contrast with the colour of the blue background. Due to pack size the minimum height of the characters is 2.5mm which is ~5mm. As per National Trade Measurement Regulations 2009. (Production) Lot Identification – Provided in the Best Before white box 816CBTOP23. The date can also be used as lot identification. 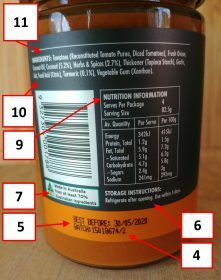 (Shelf Life) Date Marking – As this is a best before food item and is more than 3 months from the date the month and year to be applied. 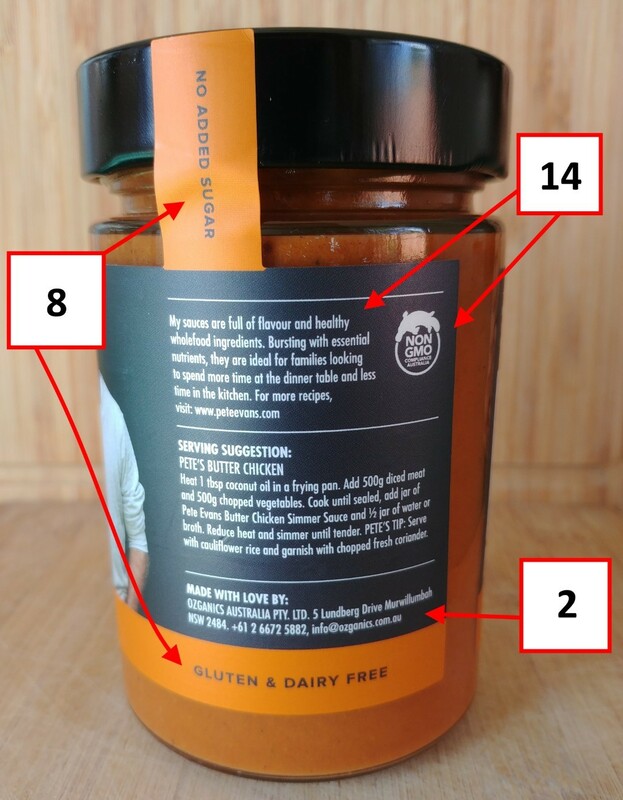 As per the Australia New Zealand Food Standards Code – Standard 1.2.5 – Information requirements – date marking 1.2.5-5(4)(b) the examples given don’t include the dash ‘/’ which is printed on the pack 04/2019. Update required to match code can include Apr 2019 or 04 2019. Directions of Use and Storage – Not needed as the requirements are if specific storage conditions are required to ensure that the food will keep until the best before date. Also for health and safety reasons. Mars can include this information if it likes for quality reasons given this is a chocolate product in the Australian climate such as ‘store in cool dry place’. 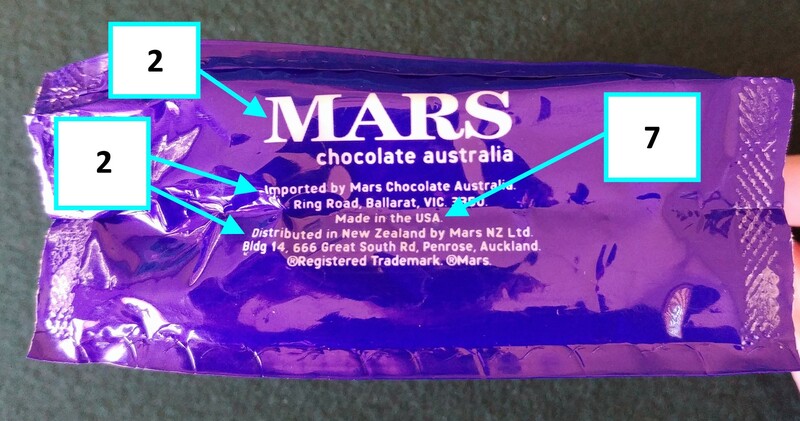 Country of Origin – As this item is a non-priority food being confectionery it only requires to carry a country of origin text statement. In this case ‘Made in the USA’ complies the Country of Origin Food Labelling Information Standard 2016 but not sure why the word ‘the’ is added. Nutrition, Health and Related Claims – No claims made as it is confectionery. Nutrition Information Requirements – Meets Australian regulation. However some notes can be made; the panel clearly indicates the average quantities as per the standard. In this case it is indicated twice in the header ‘Average Quantities’ and at the bottom ‘All nutrition values are averages’. The line ‘Your daily intakes may be higher or lower depending on your energy needs’ is not required but extra information for the consumer. Characterising Ingredients and Components of Food – As this is a caramel product and the characterising ingredient the percentage is given at 26%. Milk chocolate is also used in the product and needs to meet standard 2.10.4-2 miscellaneous standards for other foods for chocolate. At 29% cocoa solids stated on pack meets the minimum of 20% (200 g/kg) cocoa bean derivatives. The percentage of milk solids is also listed at 23% because it is ‘milk’ chocolate. List of Ingredients – Meets requirements. Food additives were used and as per schedule 7 Food additive class names were followed being thickener, emulsifier, colours, flavour and glazing agent. Some of the class names also included the e number in brackets after. The colours used in this product might raise some eyebrows; (171) Titanium dioxide, (129) Allura Red AC, (110) Sunset Yellow FCF, (102) Tartrazine, (133) Brilliant Blue FCF. Warning and Advisory Statement – Not required for this product. Legibility Requirements – No issues. 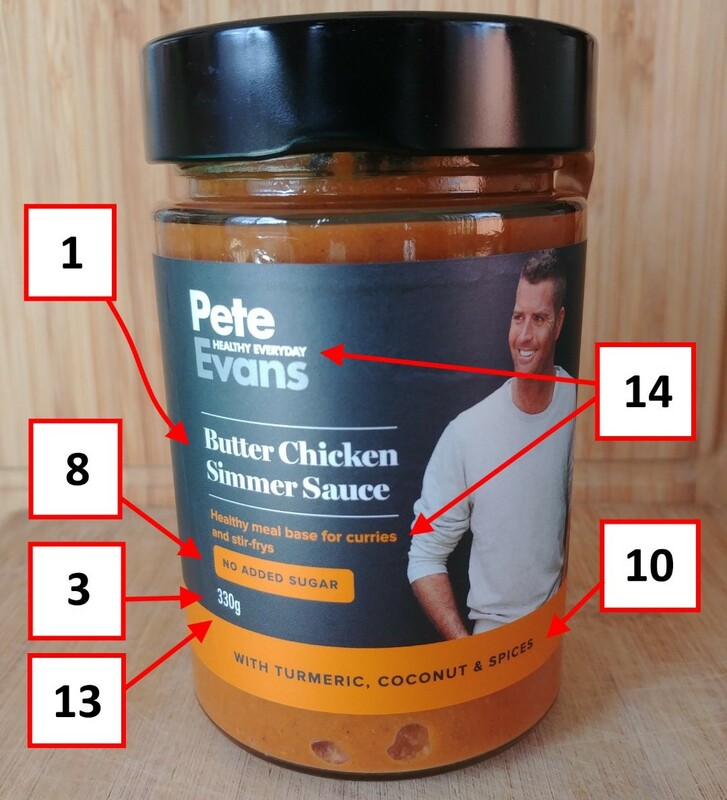 Other Information (Open) – Daily intake guide thumbnails which are voluntary and managed by Australian Food & Grocery Council. It is used to assist consumers to make inform choices as the values are preserving and daily intake percentage given. 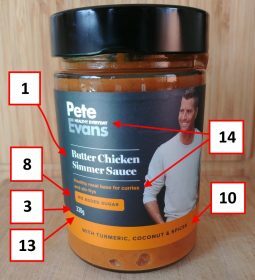 The thumbnails used on pack show the correct information but don’t follow the ‘code’ for placement and design specifications. Conclusions: Update require to best before format ‘04/2019’ replace the dash with a space ’04 2019’. The layout of the daily intake thumbnails can be adjusted. 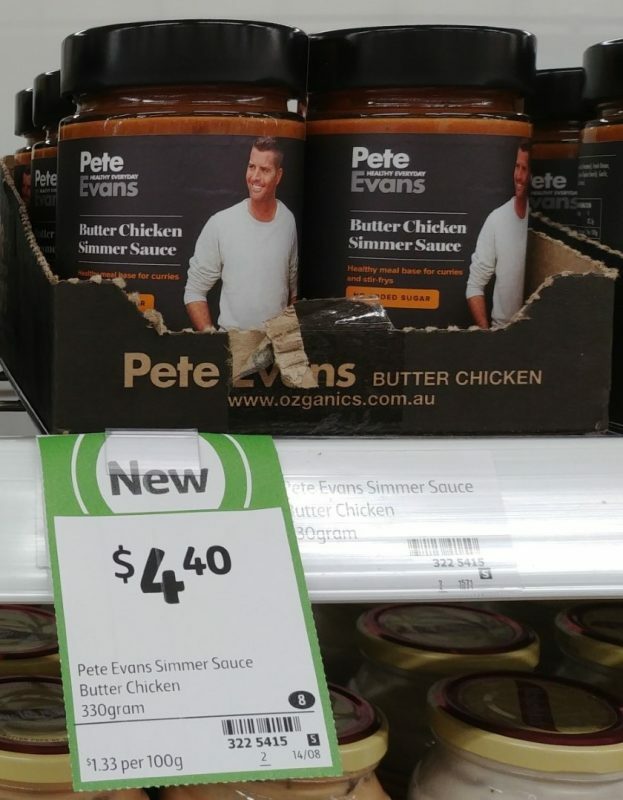 This entry was posted in Food Labelling Review – Australia on 22/08/2018 by KS.